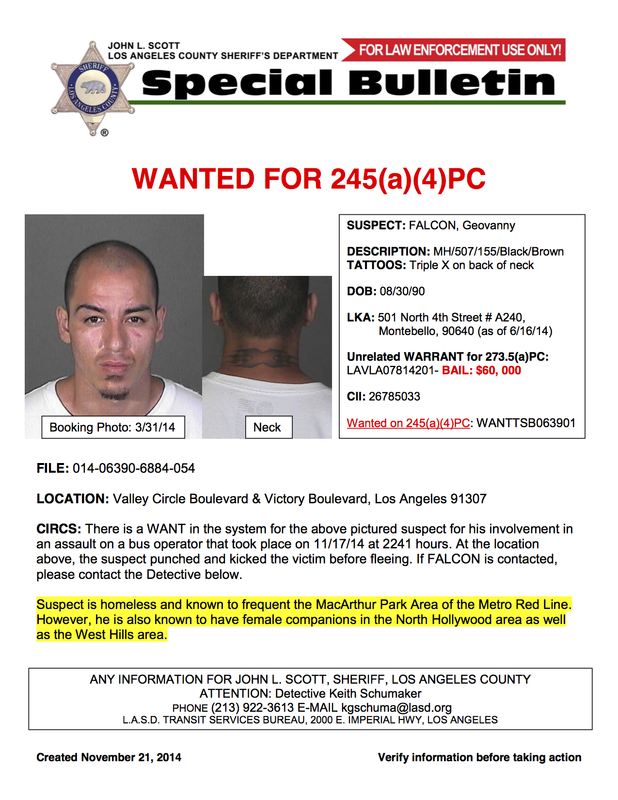 Following the brutal assault of a bus operator on her route on Monday, November 17, 2014, the Los Angeles County Sheriff’s Department (LASD) and the Los Angeles County Metropolitan Transportation Authority (Metro) are seeking the public’s assistance to find the suspect and bring him to justice. Another view of the suspect from the bus’ surveillance camera. Photo: Metro. Last week’s assault occurred at 10:40 p.m. at the corner of Victory Boulevard and Valley Circle Boulevard in West Hills. The male suspect and a female companion entered the bus while the operator was on a prescribed break and asked for a free ride. When the operator responded that she cannot leave the location for two more minutes, the suspect attacked the operator, beating her with his fists and knees. The operator, 59, suffered minor injuries in the attack and was treated and released from a local hospital. She has been recovering at the home of a relative and is expected to return to duty when she is ready. Officials talk about steps being taken by Metro to keep bus operators safe at a media event Monday afternoon. Photo: Metro. 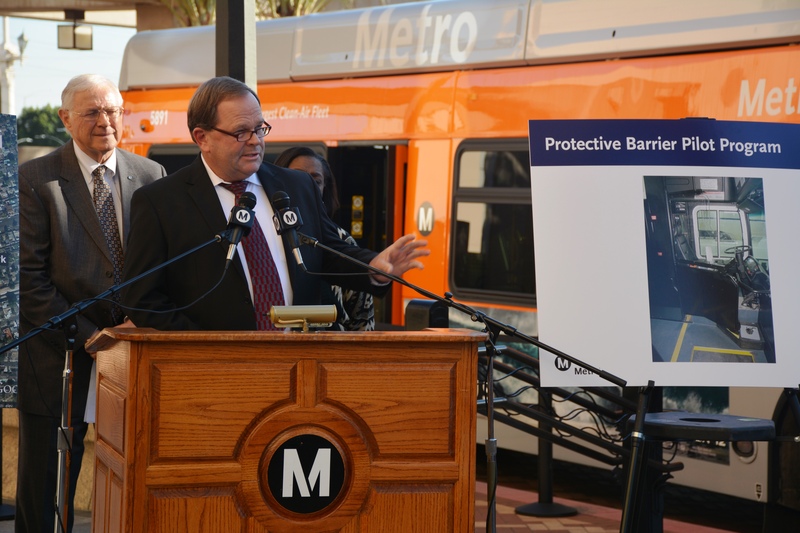 Metro has been in the process of a three-pronged strategy to enhance safety on buses focused on engineering, enforcement and education. In terms of engineering, Metro will spend at least $8 million on enhancements on Metro’s 2,000 buses. Beginning in December, Metro will conduct a pilot program to equip about 5 percent of the bus fleet with plexiglass barriers to protect bus operators from physical assault. The LASD Transit Policing Division is conducting a pilot program in which uniformed deputies ride along on targeted lines to improve safety and fare compliance. LASD has opened a satellite office at Metro’s Divison 18 in Carson and Sheriff’s deputies already conduct undercover operations on Metro buses and trains in addition to fare checks. Metro is committed to giving its employees the tools they need to defuse potentially violent situations and is in the process of identifying a transit-specific training program to help operators manage stress at and away from work. Although assaults are relatively rare events for an agency that has 350 million annual bus boardings, Metro has experienced a rise in incidents of aggravated assaults against bus operators. In calendar year 2013, there were 17 aggravated assaults against operators. In 2014, through November 23, there have been 28 aggravated assaults. California Penal Code calls for penalties that can result in a term in state prison if convicted of assaulting a bus or train operator. Metro bus drivers should be armed with pepper spray to fend off attacks from thugs like these. Attackers won’t have a chance to make an easy escape when they’re blinded until law enforcement arrives. Yes why Dont they have pepper spray with them in the first place. It is very necessary for the bus conducters to carry this at all times. They do not know what type of people will enter the bus or when an assualt will take place. All bus drivers should be armed and eqquiped with the neccesary weapons and pepper spray to fend off attacks from these type of people. Pepper spray might be an adequate deterrent if the person was planning on attacking you with his/her hands. But if the person entering the bus is armed with a concealed gun/knife, pepper spraying him/her in the face is most likely going to escalate the situation. On top of that, have you ever sprayed pepper spray in a semi-enclosed area? Macing someone who is near the operator is going to harm multiple people in the front of the bus as well. I agree, bus drivers should be provided with pepper spray. If Metro has a budget to install plexiglass, then can easily also purchase a $11 pepper spray at Big 5 and hand them out to bus drivers as part of their duty rig. If I were a Metro bus driver, I would demand to have pepper spray while on duty. Does Metro have a policy against bus drivers carrying pepper spray or something? Nothing like firing off pepper spray in an enclosed environment. I’ll bet this poor driver was beaten before she would have been able to use it anyway. Pepper spray is legal. There is no distinction between carrying pepper spray in public and private spaces, there is no law regarding the usage of it in open spaces or enclosed spaces. It is legal self-defense tool that any law-abiding citizen can purchase to protect themselves. You should try reading that document. It’s called the Bill of Rights. 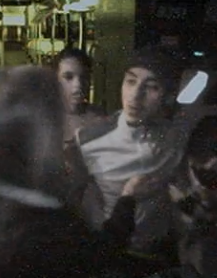 You do know that pepper spray does not work on everyone? Bullet proof plexiglass cubicle is long over due and will provide protection if done properly. May or may not provide absolute protection but hopefully long enough for deputies to arrive. Of course emergency egress, accidents and fire must be planned for. Bullet proof plexiglass isn’t foolproof either; it’s not effective against an ISIS suicide bomber and you can’t say for certain that won’t happen. Sadly, that is the world we live in today. I can’t say for certain that I won’t wake up with a billion dollars in gold bullion tomorrow, but it seems pretty unlikely. Metro bus ridership tends to be lower-income minorities, why would ISIS bomb a Metro bus? In the extremely unlikely scenario that ISIS manages an attack in Los Angeles, it would be at an event for upper class people, not a bus taking people to/from work. Doesn’t spray all over the place, sticks like glue and hard to get off. Will also help law enforcement who the bad guy is. Some writers are forgetting about unintended consequences. Such as…bus may crash when spray is used, and the operator gets it too. Mentally unstable suspects may not feel the effects of the spray, become enraged when it’s used, and escalate the conflict with predictable negative results. The list goes on. Plexiglas with a “panic button” to law enforcement, would be a lot less confrontational, and may avoid the inevitable lawsuits when others may be killed or hurt in the assault, or resultant loss of control of the bus. Sometimes you just have to draw the line somewhere. Anyone can come up with something against anything, everything has consequences, so all it comes down to is using common sense. Plexiglas is expensive to install, it has to come from taxpayer money, and it does nothing to protect the passengers onboard, only the bus driver. A bus driver presses the panic button, is protected by plexiglass, then thugs can then start lashing out on the passengers instead while the police are stuck in traffic. Police cars still travel surface streets like any other vehicle out there, do you think cars are going to move out of the way or even capable of moving out of the way in rush hour traffic on Wilshire? A can of pepper spray or gel is 11 bucks. Anyone can buy it. It’s legal. It’s cheap. There’s no law or regulation on it’s use for personal defense. And despite what naysayers claim, they all seems to be pretty darn effective to me. Just as the advocate of pepper spray says, any one can come up with something against anything, and to only consider the cost of the spray alone is plain not using common sense, as the writer suggests to others. To say or imagine a scenario, where everything goes right because pepper spray is used on the perp, is plain silly. Things can go either way, as was said against the Plexiglas idea. As to cost to taxpayers, who thinks that an assault on a driver won’t result in health costs, both immediate and in the future, and can be avoided if somehow, the “only pepper spray” idea is considered a superior deterrent. It can be another tool, but not the only one. Well, the above poster’s video got me convinced. The second Youtube video even showed the Mace company testing it in the enclosed environment on the bus. Bus drivers should be provided pepper spray. I think most people will be understanding that bus drivers should be provided with some personal protection device, especially in this case where the bus was parked and the driver was on break. The bus was not in motion. That’s where I think most assaults against bus drivers occur, when the bus is stopped, not while in motion. If people say no, Metro should just post a link to the second Youtube video which shows the Department of Homeland Security testing it out. If it’s good for DHS, it’s good for Metro bus drivers.